Are Wooden Greenhouse Kits Really Beneficial? Time and again people ask me about wooden greenhouse kits. Whether kit made from one type of material is better than the others? What would be the best kit to buy keeping in view the climate of the area they live in and the list goes on. Since people are often confused about the type of material for their greenhouse kit. I have decided to discuss the advantages and disadvantages of greenhouse kits made from different materials. Here we discuss the advantages and disadvantages of wooden greenhouse kits. Check Greenhouse Kits Price On Amazon! The first and foremost advantage of buying a greenhouse kit is that you save your time. You may find it to be a bit expensive but its money well spent. You can build a greenhouse of your own by purchasing wood locally but hard labor. Time and efforts required can really push you to your limits, both physically and mentally. Making a wooden greenhouse on your own means that you have to measure parameters, make estimates and purchase wood all on your own. After making the purchases, you have to arrange for everything to take home and then start to cut the wood according to your measurements. A little error can make all your efforts go down the drain and you may have to go back to the store to start anew. On the other hand, having a ready-made kit arrive on your door step is not only hassle free but also saves you hours of labor. When you build a greenhouse you would want it to blend with the rest of the house structure and do not look out of place in contrast to your house. Wooden greenhouses are the best and suit almost all types of household structure. The beauty of a wooden greenhouse kit depends upon the type of wood being used to build it. For example, a wooden greenhouse kit made from cedar wood is beautiful enough to grace grounds of a mansion. On the contrary, making frame by using wood from yellow pine may not look so good and may sometime not look good even in a small backyard of a tiny house. Wood is the most durable material as compared to others. A wooden greenhouse kit that is well maintained and looked after is sure to last for a long time. However, much depends upon the type of wood being used to design the frame. Again cedar wood is the best but you can also use pressure treated wood. However, it is best to start gardening when the wood has completely dried from pressure treatment. The natural insulation ability of wood makes it one the most desirable material to build greenhouse frame. Wood absorbs the direct heat of sunlight during the day saving plants from the harsh sun rays. It releases the heat during night time. Wooden greenhouse kits are no doubt one of the best however, the only problem is that wood tends to be bulky in size which does block maximum amount of sunlight from entering the greenhouses. This can be a bit of trouble to obtain sunlight for plants especially during cold winter days. 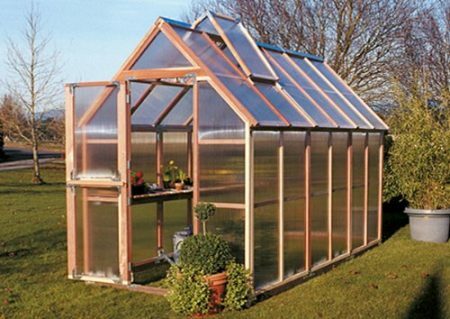 » Backyard » Are Wooden Greenhouse Kits Really Beneficial?